Marouane Fellaini faces three weeks on the sidelines. The Belgian international has possibly been the best player in the Premier League so far this season, as he has inspired Everton to a fourth-place standing after the opening seven matches. Fellaini, who scored the only goal of the opening weekend win against Manchester United, has started all games for the Toffees, and has three goals in total. However, the Goodison Park club will have to cope without the 24-year-old for the next three weeks, after he picked up a knee injury in the 2-2 draw at Wigan Athletic on Saturday. The attacking midfielder will certainly miss the trip to Queens Park Rangers when the Premier League season resumes, and is also likely to be absent for the first Merseyside derby of the season at Liverpool seven days later. A statement on the Belgian FA's website read: “Fellaini suffered a small tear at the juncture of muscle and tendon in the knee. The injury was revealed during a scan. Fellaini was injured last Saturday. He will be out for three weeks. 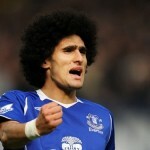 It has been agreed with his club Everton FC he will rehabilitate in Belgium during this period." Meanwhile, Everton manager David Moyes has been named the Barclays Manager of the Month for September. Despite starting the month with a first defeat of the season, 2-0 at West Bromwich Albion, the Blues recovered to secure a 2-2 draw at Newcastle United before winning at Swansea City 3-0 and beating Southampton at home 3-1. "With the quality of the Premier League it is really hard to qualify for the UEFA Champions League but I wouldn't say we can't do it. It is possible and you have to aim for that," Moyes told the club's official website. If we fall short and end up in the Europa League then so be it, but in recent years we have been pretty close, finishing sixth, seventh or eighth, so we want to do that at the very least."